Visiting Feelings harnesses a young child's innate capacity to fully experience the present moment. 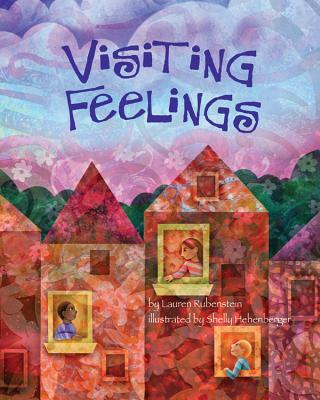 Rather than labeling or defining specific emotions and feelings, Visiting Feelings invites children to sense, explore, and befriend any feeling with acceptance and equanimity. Children can explore their emotions with their senses and gain an understanding of how feelings can lodge in the body, as conveyed by common expressions like "a pit in the stomach" or "lump in the throat." Children can cultivate this emotional intelligence and nurture a sense of mindfulness. In essence, mindfulness is tuning into yourself and paying attention to the present moment without judging or analyzing what you are thinking or feeling. Practicing mindfulness can enhance many aspects of a person's well-being, help develop insight and empathy, and enhance resiliency. Taking the time to practice mindfulness as a family is a remarkable gift for parents to give to their children, and will help children as they navigate the teen years and adulthood. Includes a "Note to Parents" to provide more information about emotional awareness, and suggests ways to seamlessly incorporate mindfulness practices into your child and family's daily routines. Lauren Rubenstein, JD, PsyD, is a licensed clinical psychologist in private practice in Bethesda, MD. She also teaches yoga and mindfulness to children and adolescents, including kids in Haiti living in extreme poverty. Her humanitarian work in Haiti has been featured in the Huffington Post. Dr. Rubenstein plans to donate proceeds from Visiting Feelings to the Go Give Yoga Foundation. Visit her at www.visitingfeelings.com. Shelly Hehenberger studied art and design at Indiana University and received her MFA in painting from the University of Cincinnati in 1994. Since that time, she has worked as an art teacher, professional artist, and illustrator of children's books. The illustrations in this book were created digitally using hand-painted textures and overlays. She lives near Chapel Hill, NC, with her husband and daughter.